The creative juices are flowing over at the San Francisco Municipal Transportation Agency (SFMTA), fueled in part by the long-delayed approval of the bicycle plan after years of litigation and by the determined efforts of influential bicycle advocates who cast a jealous eye at some of the unusual traffic experiments happening in Europe. 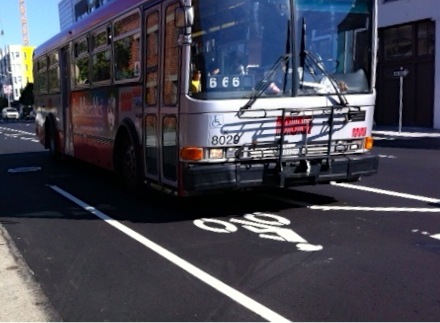 Prepare yourself for some weird bike lane configurations coming to your neighborhood soon. 8th Street in South of Market has a sorry history of pedestrian injuries, particularly around the intersection of 8th and Howard Streets, with its abundance of senior and low income residents in constant conflict with thousands of cars racing to the freeway entrances a couple blocks to the south. The street has been singled out by the city’s ENTRIPS program, a multi-agency effort tasked with developing traffic mitigations throughout the growing Eastern Neighborhoods. 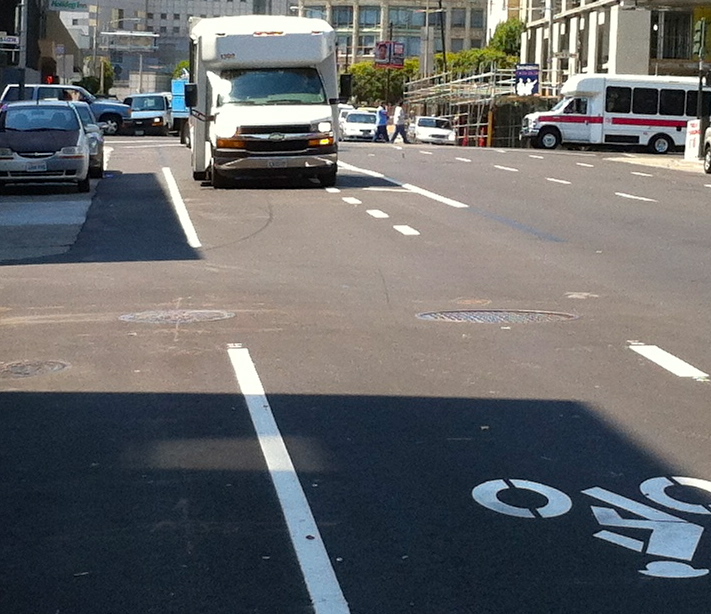 A variety of protected bike lane proposals have been generated and await environmental review. In the meantime, the SFMTA has initiated some half steps in conjunction with the routine re-paving of the street. If you haven’t been there, it’s worth checking out. Ultimately, the street needs mid-block crossings and some physical barriers. But until then, the freshly paved street has been reconfigured with wider bike lanes, a mysterious “safe zone” between the bikes and cars and three lanes of traffic. Drivers appear to be totally befuddled. The 19 Polk bus stops at every corner between Market and Harrison Streets and most drivers are loath to pull all the way across this new maze of painted lines. As the bus barrels down the middle of the bike lane, cars dutifully fall in line behind it. 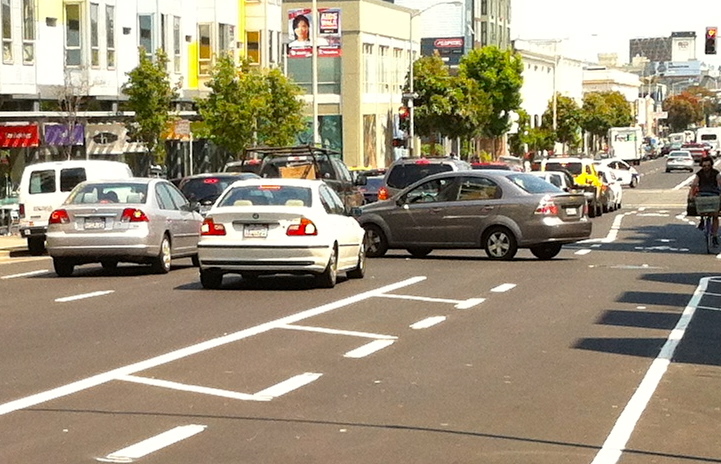 When drivers make a right turn onto the street from Mission or Folsom Streets, many find themselves in the midst of this confusing jumble of lines and either continue on in this off-limit area or slow down multiple lanes trying to fight their way into the designated traffic lanes. During a half hour of observation, numerous scofflaws blatantly disregarded the whole system and adopted this new safety zone as their own private dedicated HOV lane. The SFMTA’s heart is in the right place but 8th Street is either going to need some better signage and stricter enforcement or some simpler re-striping. Totally confusing…oh and by the way was the public consulted??? I’ve riden them several times and they are great. Its also nicer when you get out of your car b/c there’s a buffer between you and traffic. I like the safe zone between the bike lane and traffic too. Just a little space between me and cars is always nice. Its a new configuration and it will take time for folks to get used to, including Muni. Give it time. The bike improvements to 8th Street are very helpful. Thank you! Too bad the configuration could not continue south to round-about. That said, I still think we missed the boat by not doing what was done in Manhattan on 8th and 9th Avenues. There the bike lanes were placed between the curb and car parking spaces, thus protecting the bikers from traffic and double parked trucks and busses. This configuration would have worked quite well on 8th and Folsom Streets. A great step on the way to a “parking buffered” protected bike lane, one with an actual physical barrier such as a curb. Not perfect, but better. Thanks SFMTA. These bike lanes are a confusing convoluted mess. Have you seen how they have added traffic congestion to this street. This is a major traffic artery and there are rarely any bicyclists in the new lanes. Politicians grovel in front of the Bike coalition for acceptance and screw up the rest of the streets without proper research and planning. 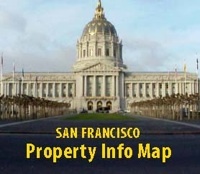 Shame of you pandering politicians in City Hall for creating this mess.